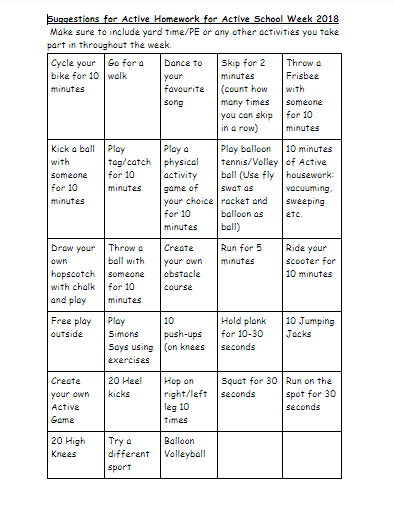 Here are some suggestions for Active Homework. This list is not exhaustive so make sure to get creative! 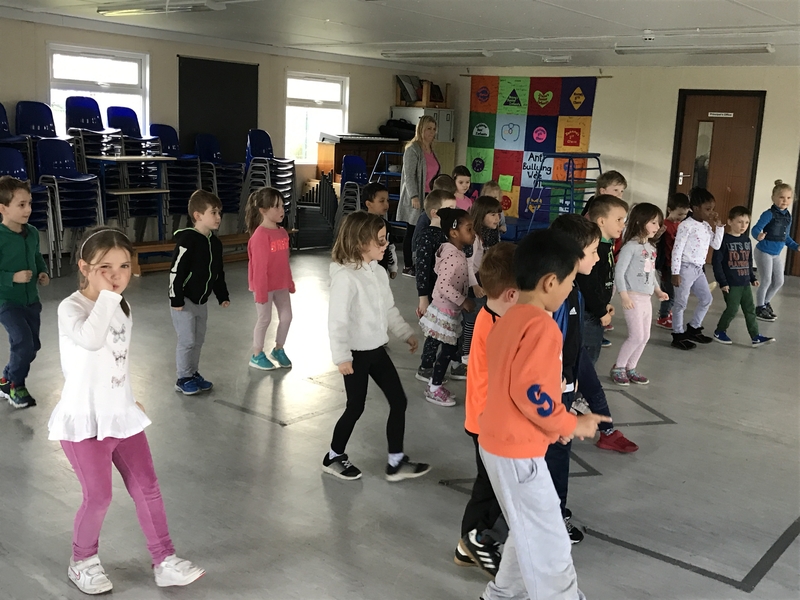 On Monday, we began the day with a Wake and Shake. All the boys and girls danced to GoNoodles songs that they liked. 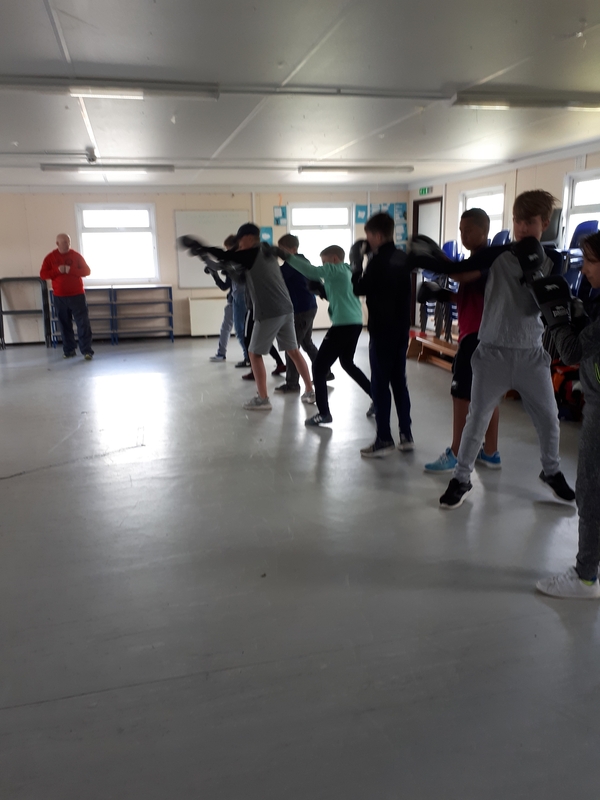 6th Class even had their own “dance off”. 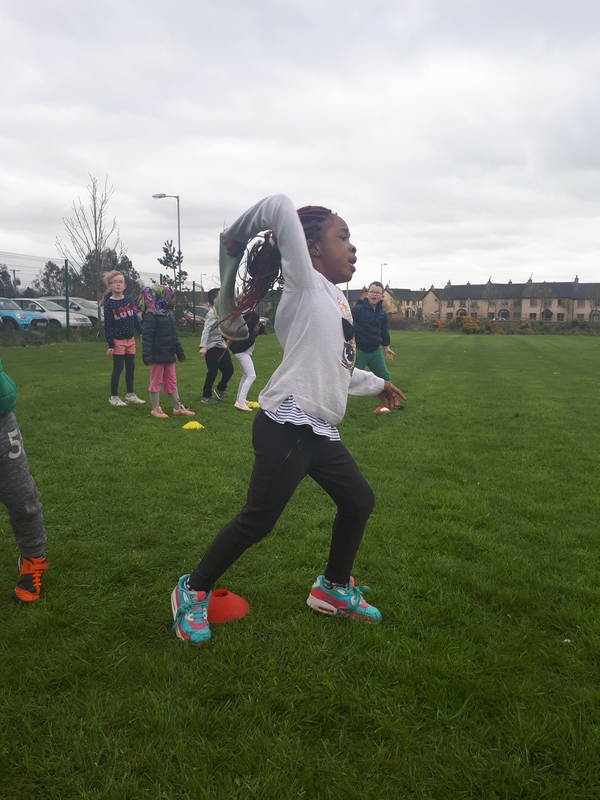 Junior Infants to 2nd Class went to the green space beside the school and had a brilliant time. 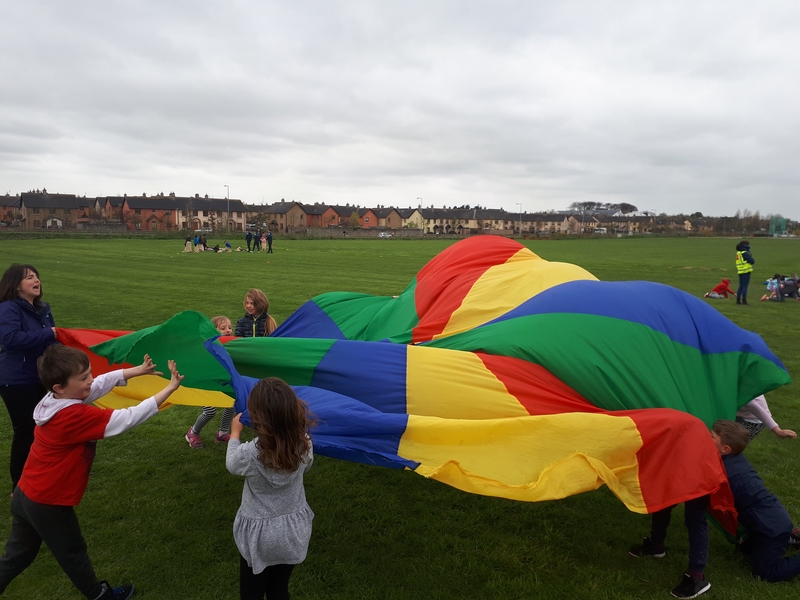 We played with a parachute, did an obstacle course, had a welly toss, did a sack race, ran in fun relays AND had a water race. 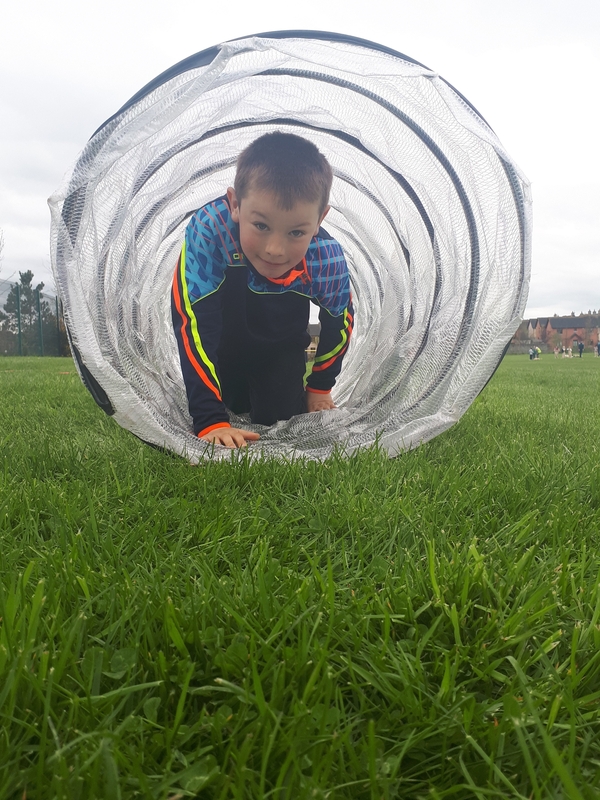 Take a look at our fun day. 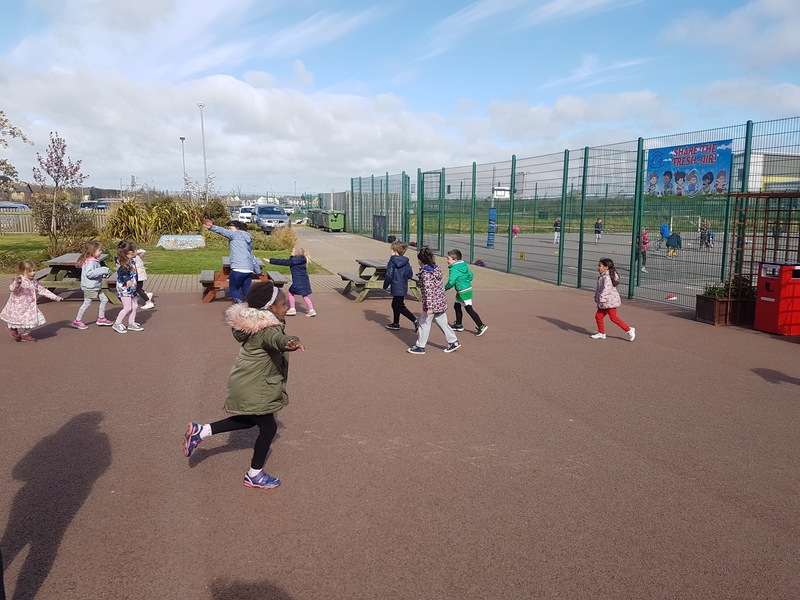 This week some classes are walking around some of the local area to litter pick. 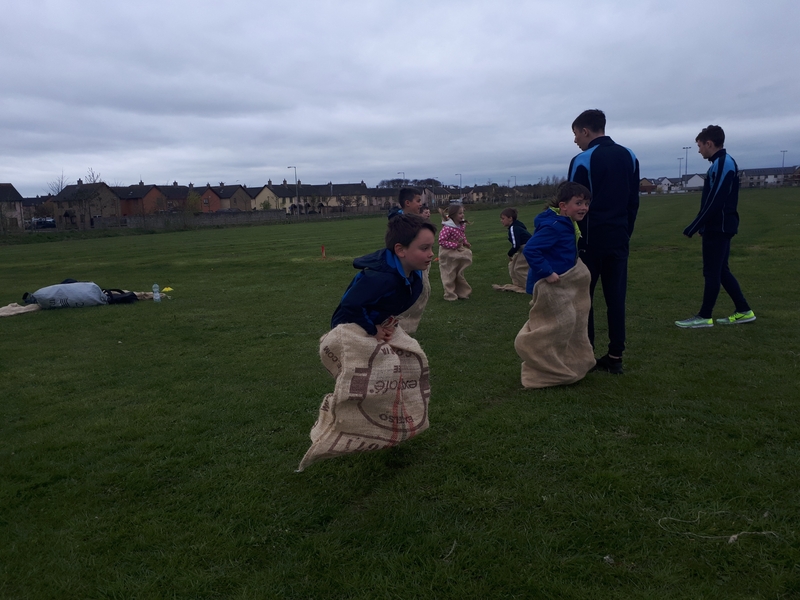 Not only are we being active, we are also helping the community stay tidy. 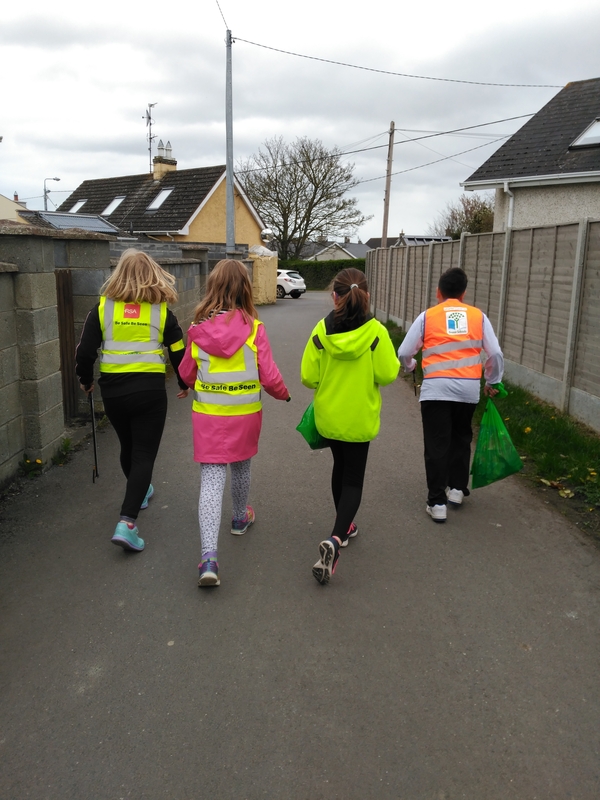 On Monday, Christine’s 1st class and Aodhan and Deirdre’s 5th classes went litter picking. Every class also did a K-A-Day. It’s so important to be active. 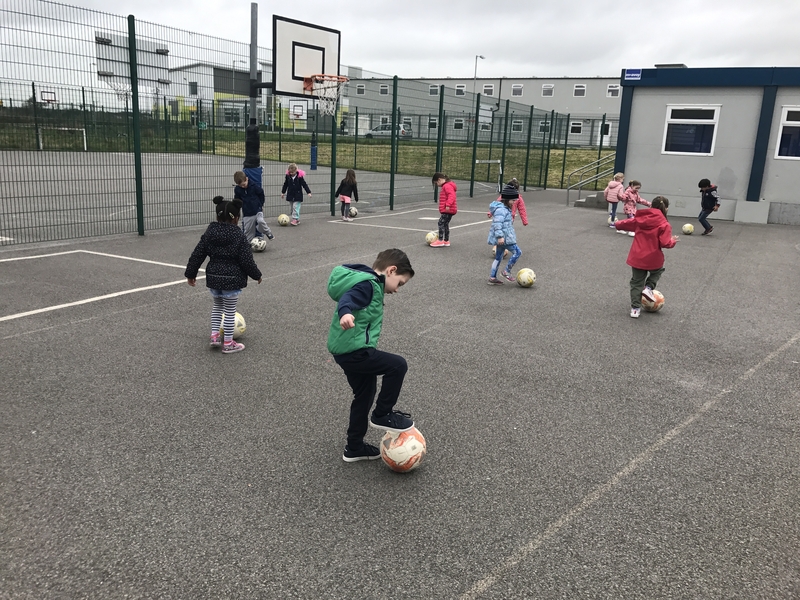 On Tuesday, (even though the weather wasn’t the best) we still had a very Active Day. We started the day with another wake and shake. Members of the Active School Committee taught the school dance moves from the video games. They were brilliant instructors. 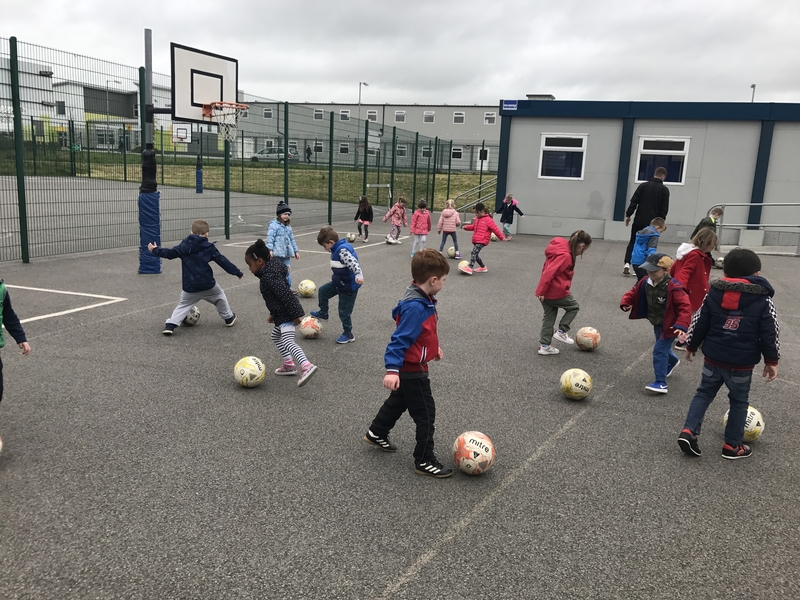 Junior Infants and Senior Infants did football with coach Ciaran from Fingal. They had lots of fun. 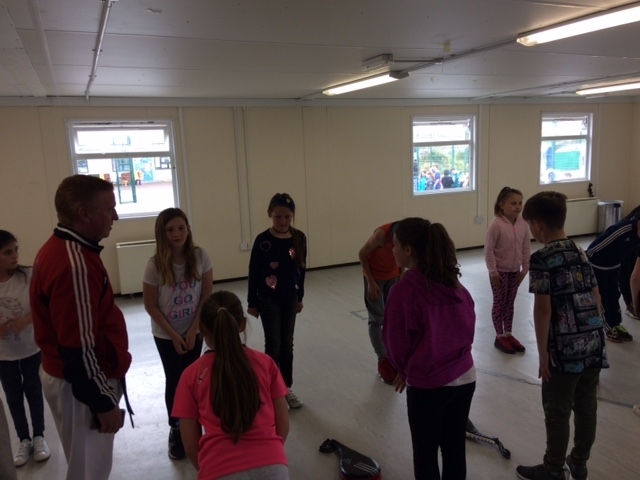 1st, 2nd, 3rd and 4th Class did Taekwando with Stuart Russell. 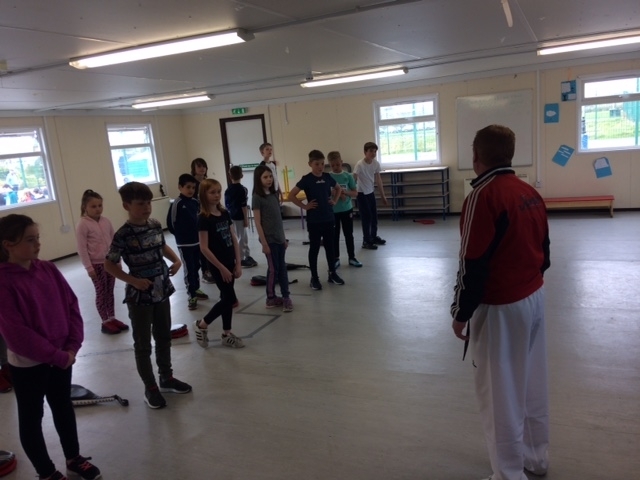 They had lots of fun and some children said that they’d like to try Taekwando outside school. 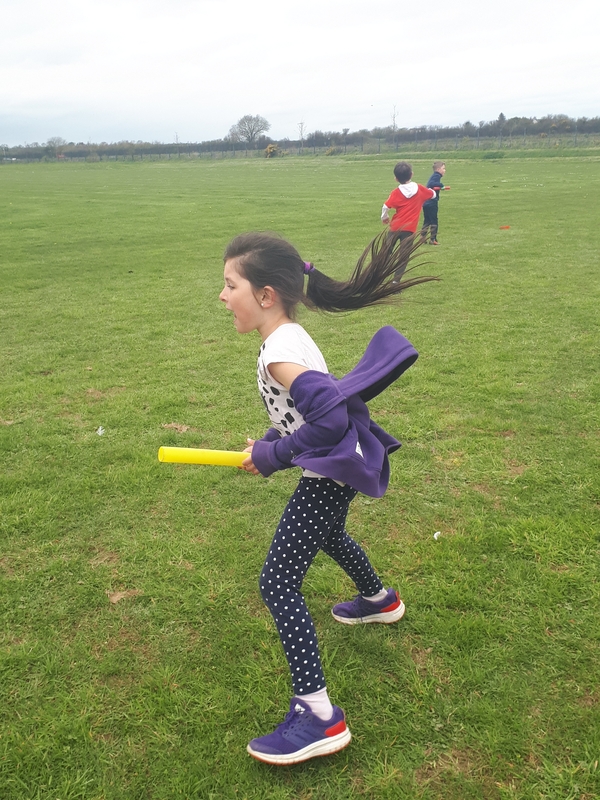 All classes continued to run their K-A-Day! The day began with COW (Cycle on Wednesday) and WOW (Walk on Wednesday). 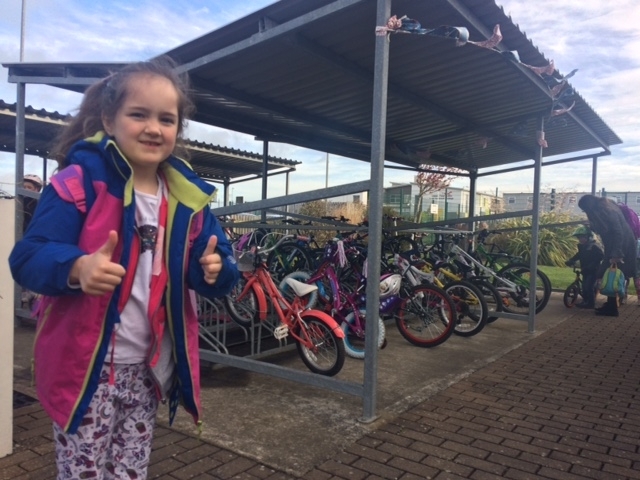 Lots of our students made an effort to cycle, walk and scoot to school. 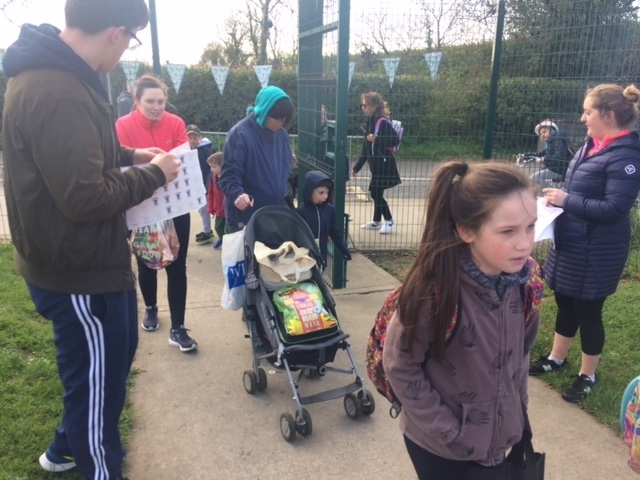 Some of our teachers met students at the Lusk United’s car park so they could park and stride to school. 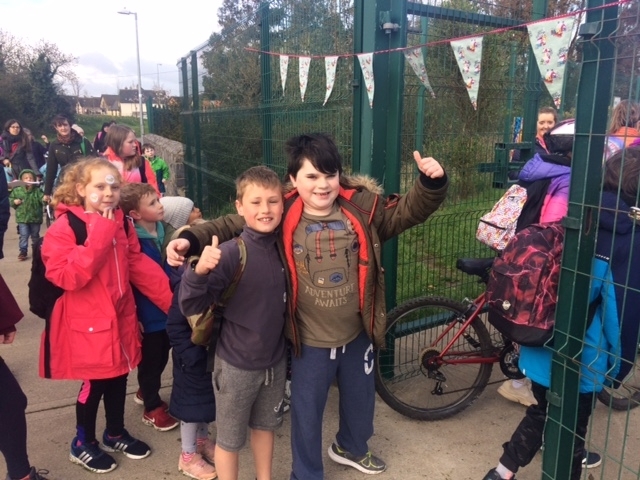 There were lots of happy faces at our school gates. 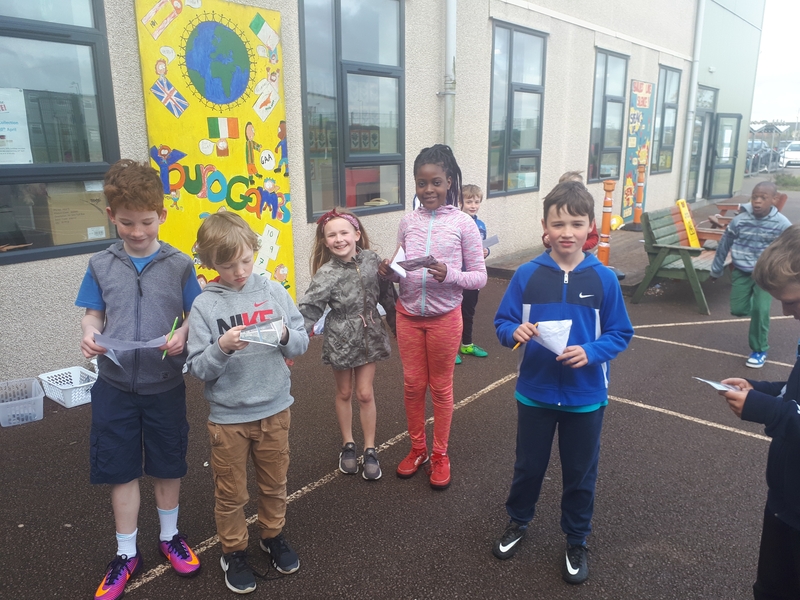 Teachers and parents handed out stickers to congratulate students on choosing to travel to school in a manner that his healthy for them and the environment. 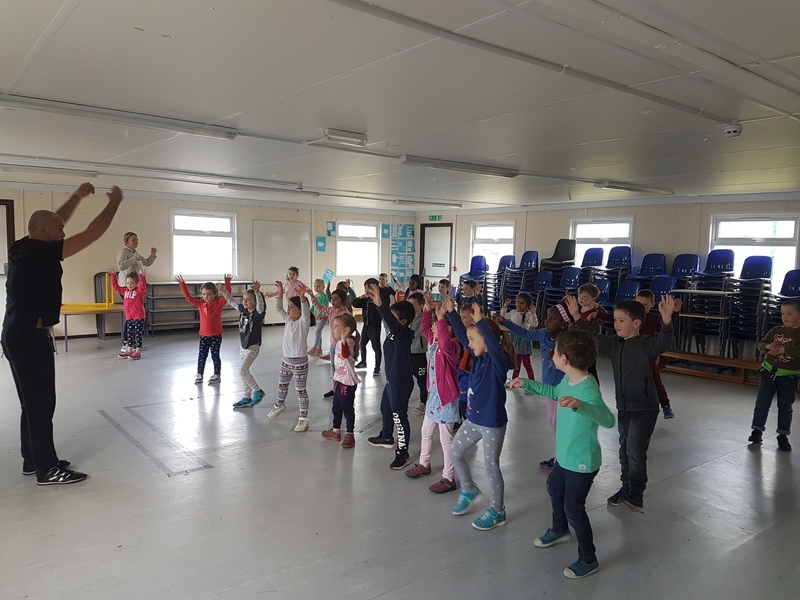 Junior Infants, Senior Infants, First Class and Second class put on their dancing shoes with Kevin Woods. 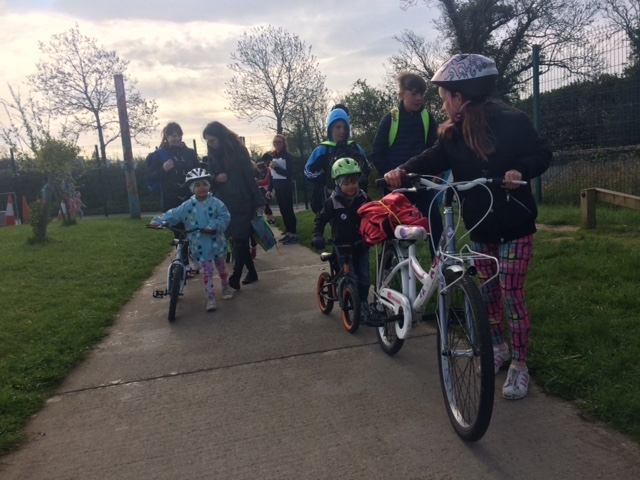 Fifth class went cycling on the road for the first time as part of their final cycling workshop. 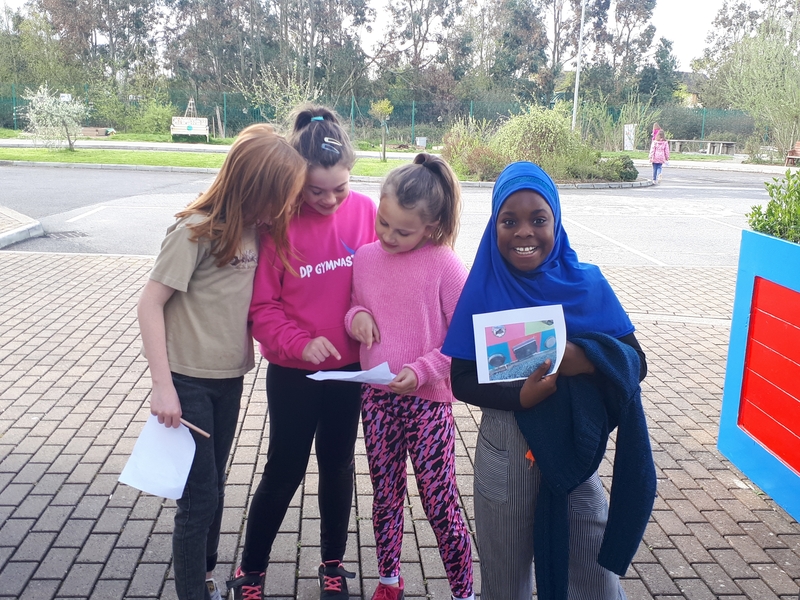 Third and fourth class but on their drew on all their geographic knowledge as they completed an orienteering challenge around the school grounds. 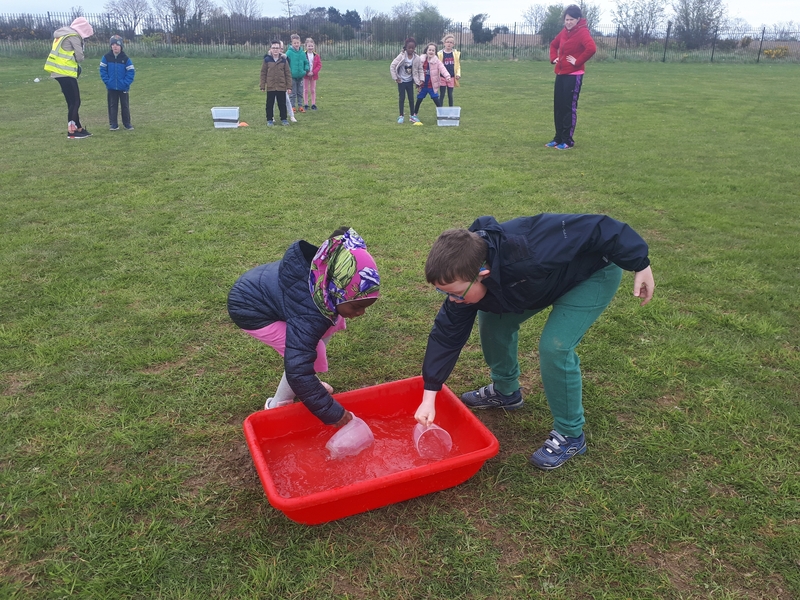 We had another fantastic day on Thursday. It began with a Blues Brother’s themed Wake and Shake. 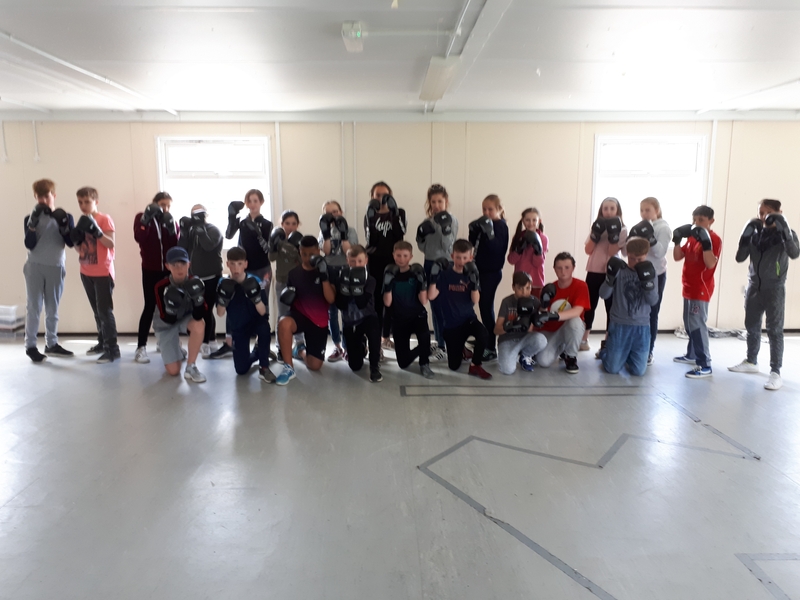 Fifth and Sixth classes sought to channel their inner Katie Taylor as Paul Cowzer, from Rush Fighting Academy, gave them introduction to boxing. Meanwhile, the basketball courts were converted to tennis courts for the day. 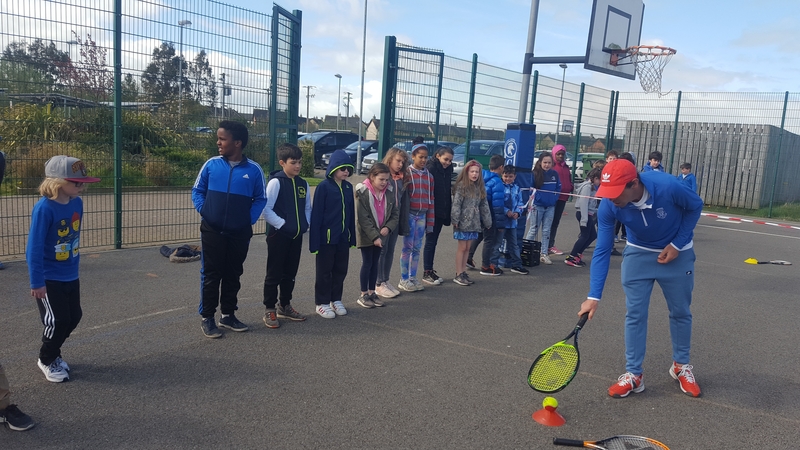 Check out some pictures of First, Second, Third and Fourth class trying their hand at tennis. 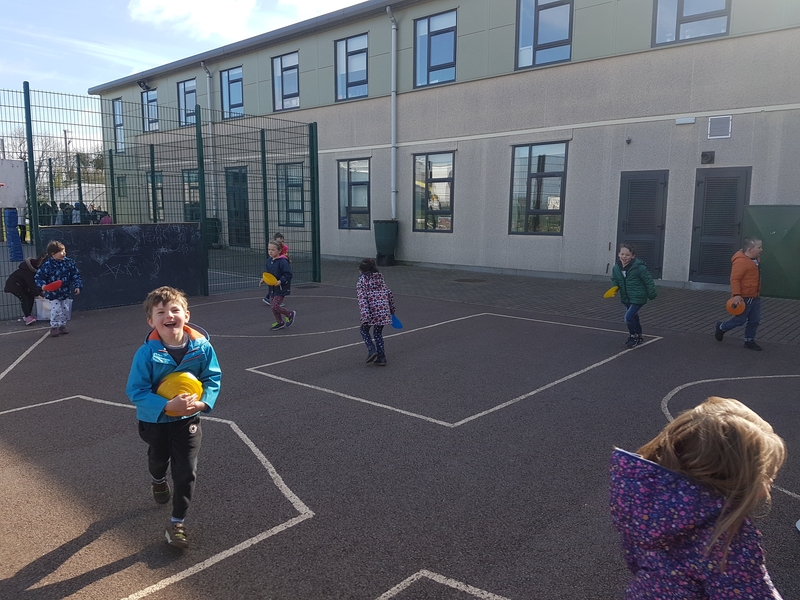 Junior and Senior infants learned some new playground games to try out on yard and had buckets of fun! 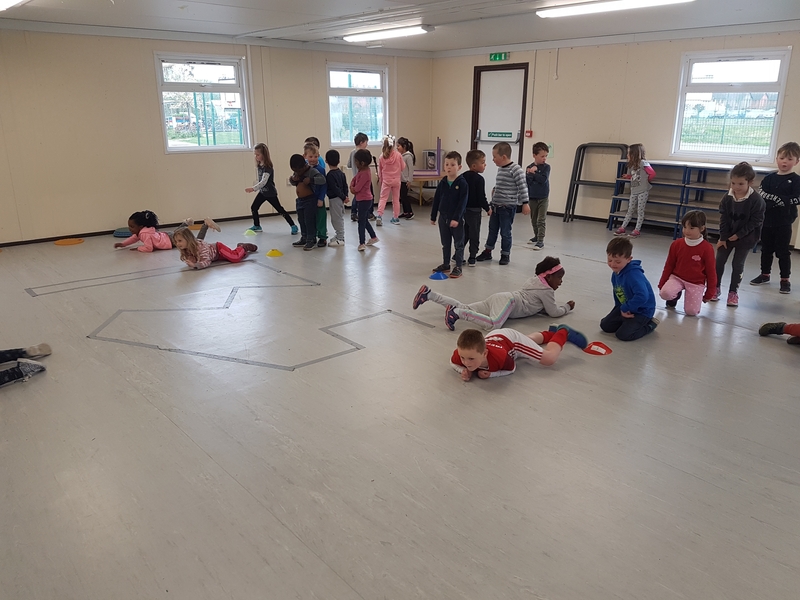 Friday began with another K-a-day organised by the Active School Committee. 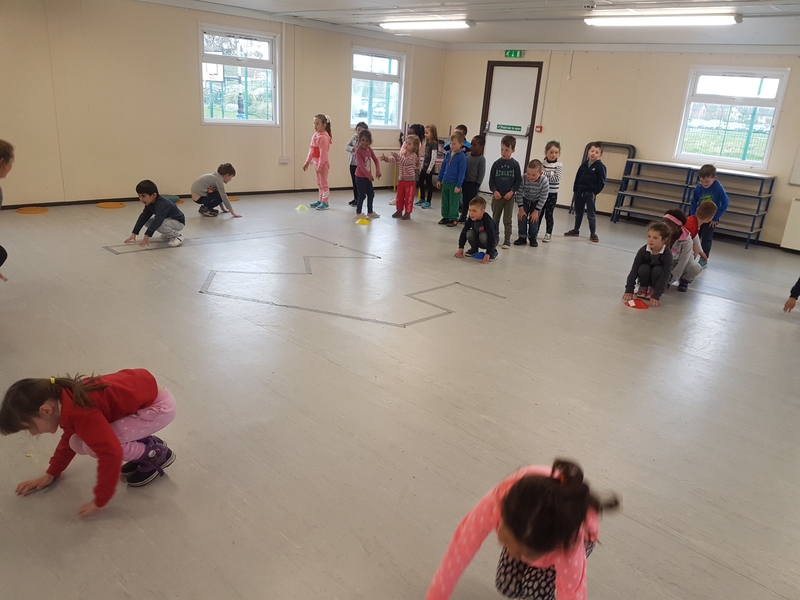 Some of the Junior classes competed in animal races in the hall. 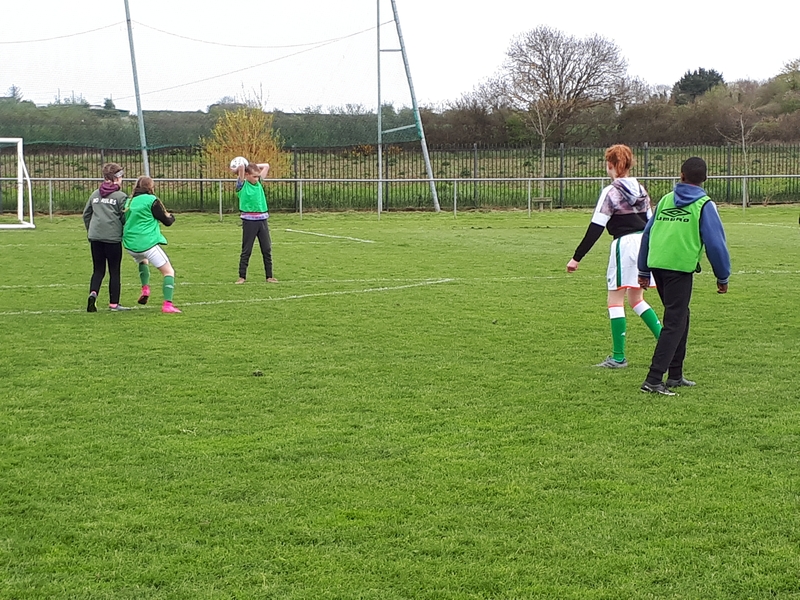 The senior classes participated in a football blitz which was kindly facilitated by Lusk Utd at their grounds. 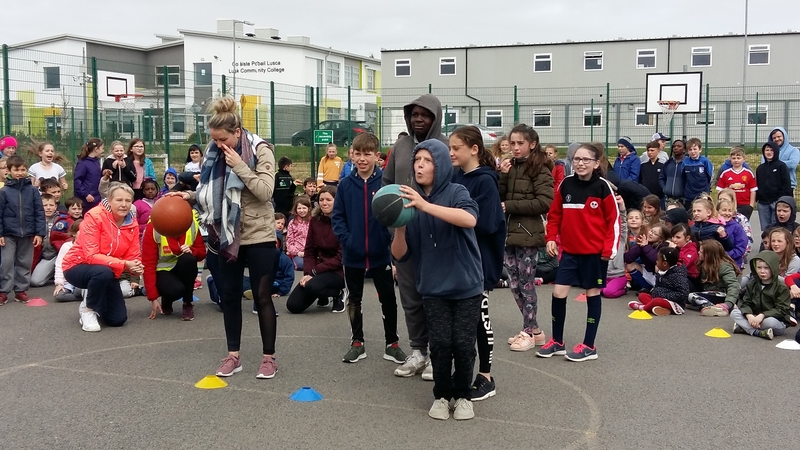 Finally, a fantastic week was capped off by a brilliant ‘Take on the Teacher’ event which had everything from basketball to dancing. 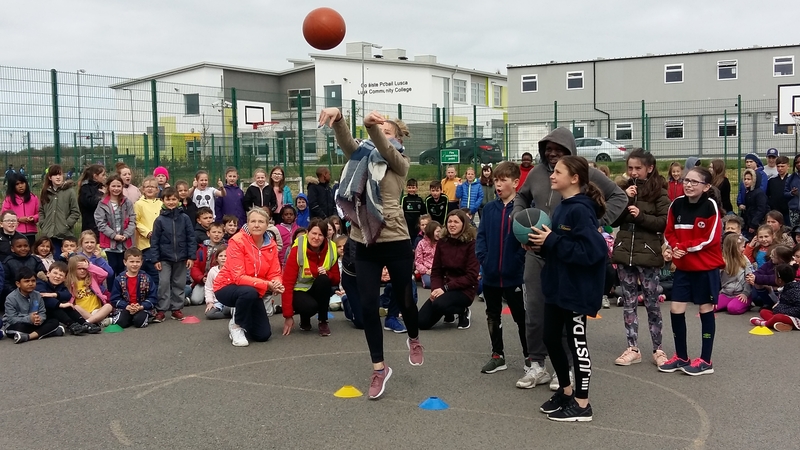 The entire school came out to watch everyone had a fantastic time. 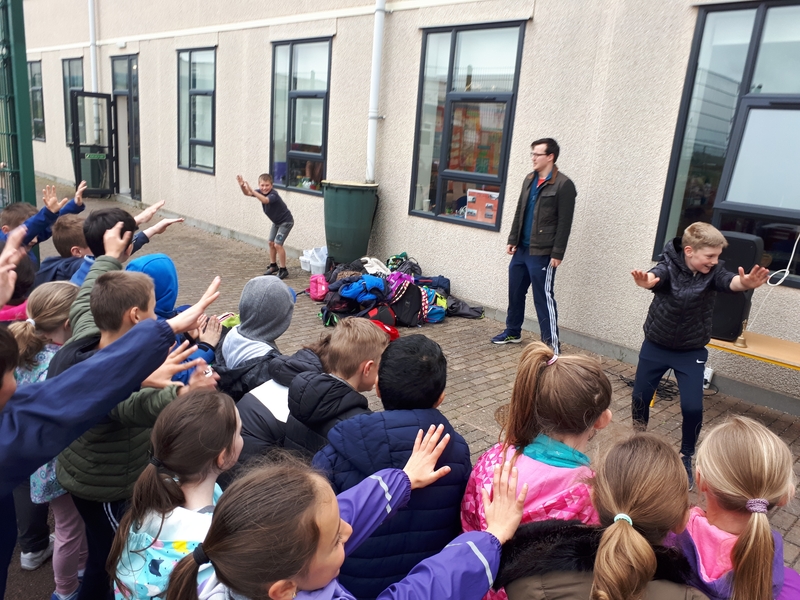 The first ‘Take on the Teacher’ event in September ended with a student victory and this time around, despite the best efforts of the teachers, the children won again! 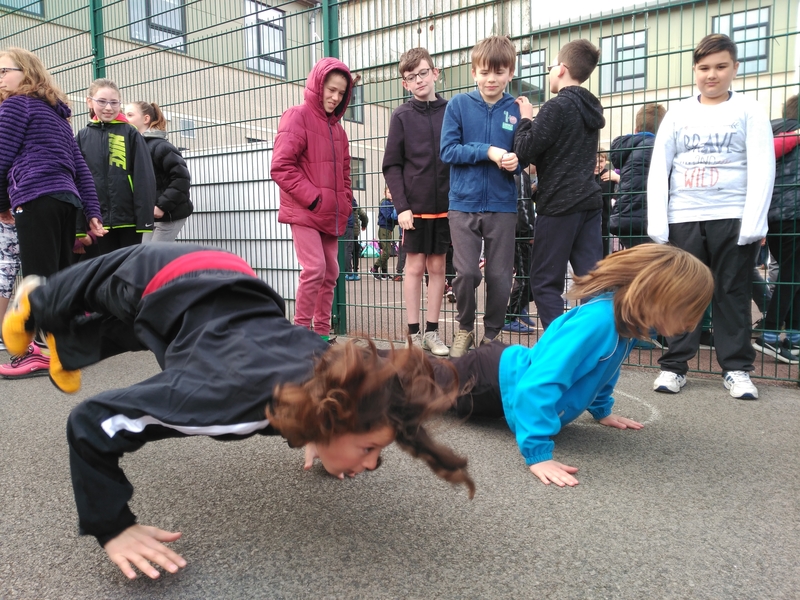 Active Week will take place from the 23rd to the 27th of April. There will be lots of different things planned! 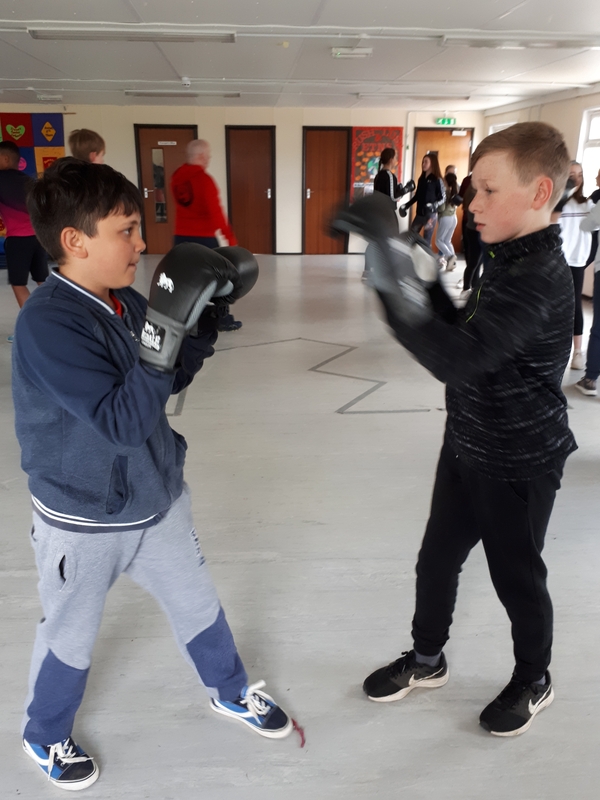 Healthy Mind, Healthy Body Fortnight, 2017.